One of the most perplexing sagas in the fascinating chronicles of cryptozoology is the long-running search for the thunderbird photograph, supposedly missing, presumed lost, for over a century. Here is an investigation that I conducted quite a while ago with regard to this mystifying picture, which has never previously been published in full, but is presented here now as another ShukerNature exclusive. According to traditional Native American Indian lore, thunderbirds were enormous birds of prey that flew through the skies on immense wings, creating thunder when flapping them together, and sometimes even abducting unwary humans. Once dismissed as wholly mythical, many sightings have been made during modern times in the U.S.A., however, notably in the Pacific West and mid-West states, of unidentified yet seemingly gigantic condor-like or vulture-like birds soaring high through the skies and even occasionally encountered perched on the ground, which seem to be veritable 20th/21st-Century thunderbirds. However, science needs something more tangible than eyewitness accounts to consider before accepting the existence of such astonishing creatures - which is why the thunderbird photograph's history has attracted such interest. 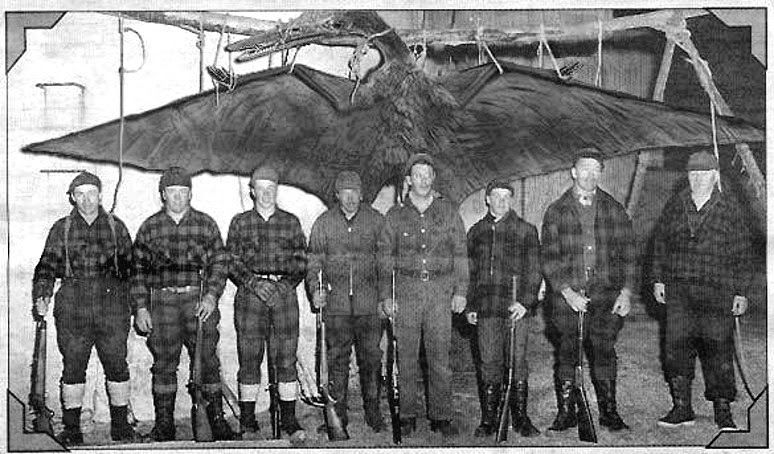 It all (allegedly) began back in 1886, when an Arizona newspaper called the Tombstone Epitaph supposedly published a very striking photograph, which depicted a huge dead pterodactyl-like bird with open beak and enormous outstretched wings, nailed to a barn and flanked by some men. This bird was reputed to be a thunderbird, and judging from the size scale provided by the height of the men standing alongside it, its wingspan appeared to be an awesome 36 ft! 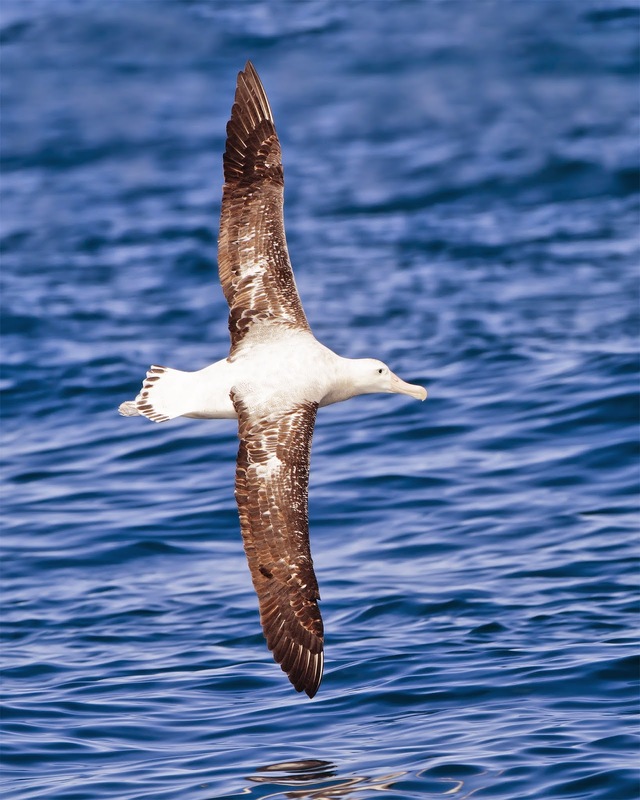 In other words, it was three times greater than that of the wandering albatross Diomedea exulans - the bird species currently holding the record for the world's biggest modern-day wingspan. Since then, countless people claim to have seen this same photo in various magazines published some time during the 1960s or early 1970s, but no-one can remember precisely where. Those publications thought to be likely sources of such a picture include Saga, True, Argosy, and various of the many Western-type magazines in existence during this period in America, but searches through runs of these publications have failed to uncover any evidence of it. Nor has anyone come forward with a copy of this photo as published elsewhere, and the archives of the Tombstone Epitaph do not have any copy of it either. A number of photos claimed to be this evanescent, iconic image have been aired over the years, especially online, but these have all been exposed as hoaxes. To keep this section of the present article in proportion to the rest of it, I'll refrain from documenting every one of them here (the subject of a future ShukerNature article instead, perhaps? ), and will just confine myself to two representative examples. The second hoax thunderbird photograph that I'm documenting here, and which is reproduced below, is of much more recent occurrence. Of unknown origin, it seemingly first appeared online in 2011, was rapidly included in numerous websites and blogs devoted to cryptozoology and to mysterious phenomena in general, and engendered much bemusement and controversy as to whether or not it was genuine, particularly as the thunderbird in it was a pterodactyl rather than a bird. Happily, however, when American student and ardent cryptozoological researcher Jay Cooney saw it, he realised that it looked familiar to him, so he conducted an internet image search of pterodactyl models. And sure enough, in one particular online stock-photo library he succeeded in finding a photograph of a model of the late Jurassic pterosaur Pterodactylus (click here to see it) that corresponded precisely with the pterodactyl in the supposed thunderbird photo. The latter's image had been lifted directly from the online stock photo of the Pterodactylus model. Another alleged thunderbird photograph duly discredited. Congratulations to Jay for his astute discovery – click here to access his own full coverage of it in his excellent Bizarre Zoology blog. While researching for my book In Search of Prehistoric Survivors, published in 1995 and containing a large section dealing with thunderbirds, I decided to conduct some investigations of my own concerning this elusive picture. I began them by focusing my attention upon Saga. This is an American magazine that has published many cryptozoological articles and illustrations over the years, and was deemed by longstanding thunderbird photo seekers such as the late W. Ritchie Benedict and the late Mark Chorvinsky to be a promising source of such a picture. As there does not appear to be a complete or even near-complete run of this magazine on file in any British library, I contacted the Library of Congress in Washington DC, whose research specialist, Travis Westly, very kindly agreed to search through every Saga issue published between January 1966 and March 1969 - a likely period during which this type of photo would have been published in Saga. Alas, no such picture was present, nor even a mention of any type of gigantic mystery bird. THE THUNDERBIRD PHOTO ON TELEVISION? 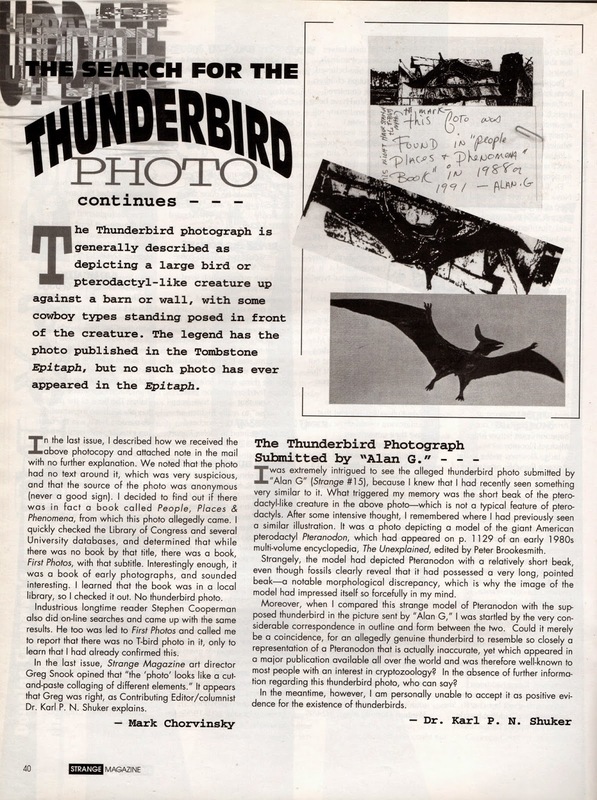 Another widely-popularised claim that I decided to pursue is that a copy of the thunderbird photo was displayed on television by American cryptozoologist Ivan T. Sanderson during the early 1970s, when appearing as a guest in an episode of the long-running Canadian series 'The Pierre Berton Show'. Consequently, I contacted the Audio-Visual Public Service division within the National Archives of Canada, to enquire whether a copy of the Sanderson episode in this series had been preserved. Unfortunately, however, I learnt from research assistant Caroline Forcier Holloway that she had been unable to locate this particular episode, and needed a precise production or release date for it in order to continue looking, because there were 597 episodes in this series still in existence, each of which contained more than one guest. Moreover, there were others that seemed to have been lost, so there was no guarantee that the episode containing Sanderson was among the 597 preserved ones anyway. "The particular episode of the programme...did not take place in the early 1970s. I remember watching the segment dealing with the thunderbird - part of an extended interview Pierre Berton had with Ivan Sanderson - from my home, when I was an undergraduate student at the University of Winnipeg in the mid-1960s. By the 1970s I was in graduate school in Edmonton. I know the programme could not have aired much later than 1965, because I recall discussing it initially with my mother and grandmother, who had also watched the show; with college friends, who made me the subject of much good-natured ridicule; and sometime later with a friend from Calgary whom I had met while employed on the Canadian Pacific Railway, as I was (over the summer months) from 1965 to 1967. I cannot recall the precise date of this conversation with my railroad friend, nor can I recollect the date I watched the programme with pinpoint accuracy, but would guess that it aired the winter before my first summer on the railroad, that is, 1964-65; at the very latest, the following year (1965-66). That might be a good place to start." "To the best of my recollection, the photograph was not shown, at least not on this particular programme. I definitely recall Sanderson's allusions to the photograph, which he described vividly and with great precision. Although I can envision Sanderson's description as if it were yesterday - the bird nailed to the wall of the barn, the men standing in a line spanning the wingspan, etc - he did not, however, have the photograph in his possession when the interview took place, although he certainly claimed to have seen it. Incidentally, some time after this, Sanderson set up a society for the investigation of paranormal phenomena [SITU - the Society for the Investigation of The Unexplained]. I joined, and in response to my inquiry about the photograph, was told that they did not have a copy. Receiving this news led me to wonder at the time if the photograph might be an example of an urban myth or legend." If, as would now seem to be the case, the thunderbird photo was not shown by Sanderson on 'The Pierre Berton Show' after all, one of the most promising avenues for tracing it - by seeking an existing copy of this specific show - has gone. URBAN FOLKLORE, OR FALSE MEMORY SYNDROME? Perhaps, therefore, as sceptics have often suggested, the thunderbird photo has never existed at all, and should therefore be dismissed as nothing more than an example of urban folklore. Having said that, there are others, including myself, who wonder whether at least some of those people who claim to have seen it have actually seen a superficially similar picture, depicting some large but known species of bird with wings outstretched, and years later have mis-remembered what they saw, erroneously believing that they had actually seen the thunderbird photo. Such an event would be a classic case of false memory syndrome. 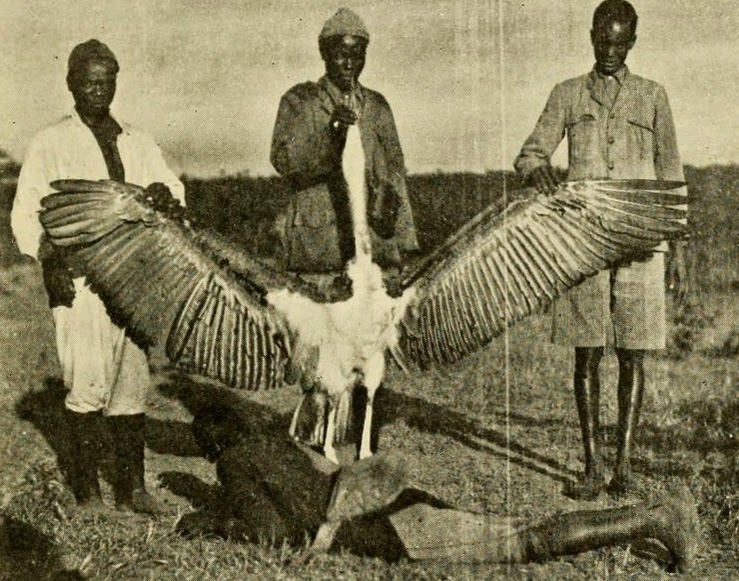 Interestingly, one photograph that could certainly have inspired people to believe that they had seen the genuine thunderbird photo is one of a large marabou stork held with its beak open and its massive wings outstretched by some native men, reproduced at the beginning of this present ShukerNature post and again below. Tellingly, it appeared in a number of popular books worldwide during the early 1970s, including none other than the Guinness Book of Records, which at that time was second only to the Bible as the world's bestselling book, so was certainly seen by a vast number of people around the globe. "Numerous people around the world believe that at one time or another they have seen the notorious "missing thunderbird photograph," allegedly published within a Tombstone Epitaph newspaper report in 1886 (see Strange Magazines #5, 6, 7, 11). In view of its extraordinary elusiveness, however, in many cases it is much more likely that their assumption is founded upon a confused, hazily recalled memory of some other, superficially similar picture instead – i.e. a "lookalike" photograph. A particularly noteworthy "lookalike" for the missing thunderbird photograph appeared on p. 35 of the British version of the Guinness Book of Records (19th edition, published in 1972), and is reproduced alongside this letter of mine. It depicts a large African marabou stork Leptoptilus crumeniferus standing upright with its extremely large wings (which can yield a wingspan in excess of 10 ft.) held outstretched by some native tribesmen flanking it, and with its startlingly pterodactyl-like beak open wide. This picture thus incorporates a number of features supposedly present in the thunderbird photograph – a very big bird with a pointed pterodactyl-like head, and an extremely large wingspan, whose wings are outstretched, and flanked by various men. Bearing in mind that the photo is a very old one (possibly dating back to the first half of this century [i.e. the 20th Century]), and also that the Guinness Book of Records is a worldwide bestseller, and that this photo might well have appeared not only in the English version but also in many (if not all) of this book's other versions around the world [as far as I am aware, the same picture layout does indeed appear in all versions worldwide within any given year], it is evident that countless people will have seen it over the years, of which some may well have been unconsciously influenced by its striking (indeed, archetypal) image when contemplating the issue of the missing thunderbird photograph." "Although your suggestion that people's memories of a similar photograph might have been confused with that of the thunderbird is entirely possible, as I'm sure you know, Sanderson was a great raconteur, a man whose verbal gifts could cause anyone to imagine that they had actually seen something he had only described in words. Indeed, many years after watching the programme, I met an individual who had also seen the Berton interview and was initially positive that the picture had been shown." Yes indeed, the power of verbal suggestion. Wars have been instigated as a result of the mesmerising oratory skills of certain leaders, let alone belief that a picture had been shown on a television programme when in reality no such appearance had occurred. 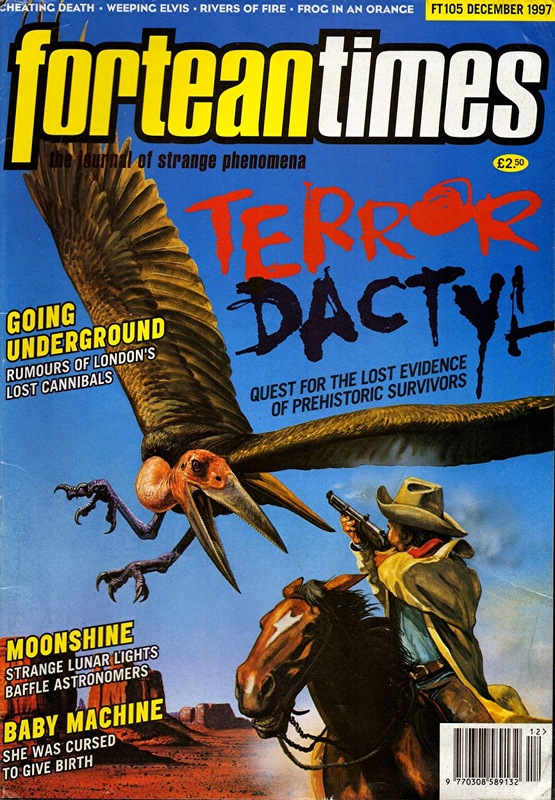 Incidentally, the December 1997 issue of Fortean Times not only contained a detailed account of modern-day thunderbird reports by veteran American cryptozoologist Mark Hall but also included a succinct account of my suggestion that the marabou stork photo in the Guinness Book of Records 1972 edition may have influenced some people in their belief that they had seen the missing thunderbird photo. Deftly combining our separate contributions to the subject, this issue's front cover duly sported a breathtaking illustration by artist Steve Kirk of a marabou stork-inspired thunderbird! "In an interesting reply, they both denied any knowledge of the picture and also pointed out that the reproduction of photographs in newspapers was at that time – the late nineteenth century – not common anywhere in North America. In checking our local newspaper – the Winnipeg Free Press – to see if this was the case, I found that photographs rarely if ever appeared before the early 1900s, at least in that newspaper." So is the thunderbird photograph fictitious, illusive rather than elusive, nothing more than a fable of our times, perpetuated into the present day by false memory syndrome – inspired in turn by visual lookalikes and seductive verbal suggestion? Or, against all the odds, might it truly be real? Could there actually be a missing thunderbird photo, concealed in some old, yellowing magazine somewhere? Next time that you clean out your attic and find a pile of dusty mags there, have a look through them before you throw them out – just in case. You never know what you may discover inside! And needless to say, if you do find the thunderbird photograph, be sure to contact me and let me see it! 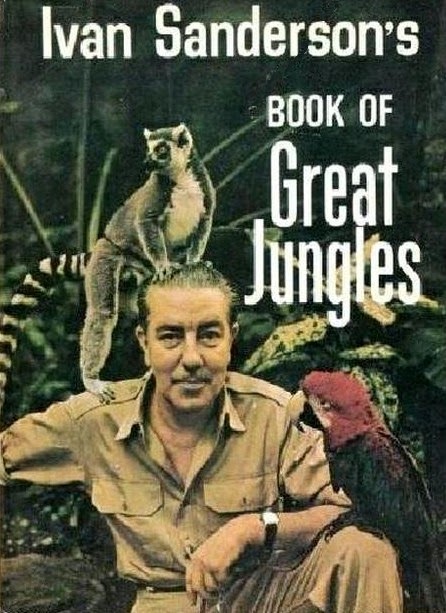 I wish to dedicate this ShukerNature blog post to the memory of the late Mark Chorvinsky, the founder and editor of Strange Magazine and a wonderful friend to me, whose encouragement, friendship, and support during my formative years as a cryptozoological researcher and writer boosted my confidence and credibility enormously. Thank you always, Mark. 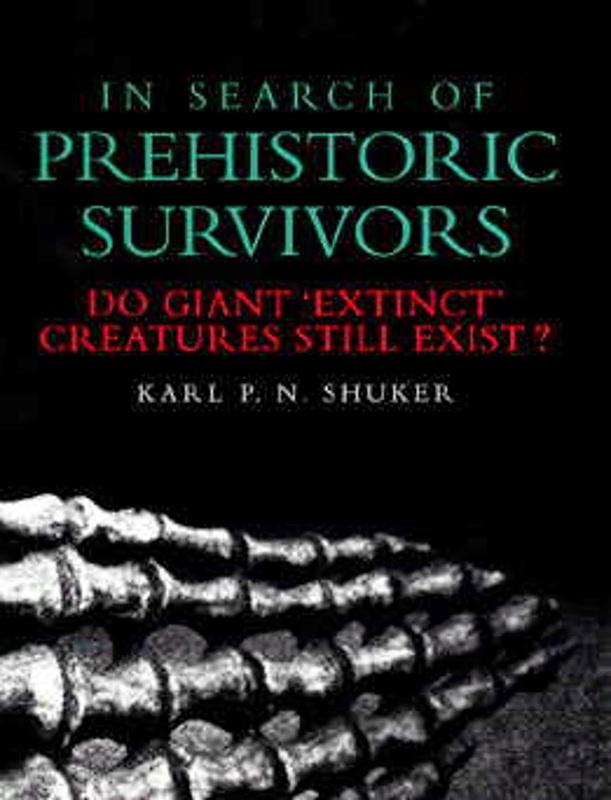 For plenty of additional information concerning putative modern-day thunderbirds, be sure to check out my book In Search of Prehistoric Survivors. I remember seeing the elusive photograph many years ago in either a magazine or book. If my memory serves me correctly, the position of the head was like that of the marabou in the second photograph. The wings were outstretched along the wall of the barn it was attached to and it seemed to be huge, probably 40 to 50 feet in width. In the foreground were the men who allegedly shot the animal, giving a better sense of the huge wingspan it had. I also remember that the man in the far left hand side was holding a rifle across his arms, a detail that makes my memory of it seem that much more accurate. What struck me as odd was the overall graininess of the reproduction, which indicated to me that the photo was either old or meant to look old. Another thing I remember was that there were no telltale signs of cropping around the "bird", suggestive of a hoax. What I looked for were tiny dots lining the outline of the animal, suggestive of cropping on old magazine or book photos. The impression I got was that this was one of the eeriest photos of a cryptid I have ever seen. Interesting! Thanks very much for posting such a detailed first-hand account of your sighting here. I also remember it was stretched along a wood fence or wall the one thing that stood out from the others was the large feathers .this was in the late seventies in Savannah TN the old south school which burned some many years after closing.don't remember the book but I do remember it had a note under that stated the owner to be one of the men pictured that family resides in tombstone area. I remember seeing a photo like this back in the seventies. In a magazine. What makes my memory even more evocative, is that i grew up near Tombstone, and actually went to the Tombstone Arizona school district for the first 6 years of my schooling. I never heard about this story from any of the local legends, even though this whole region is a storied, historic place. Are there any local newspapers other than the Tombstone Epitaph that may have carried such a story back in the late 1880s/early 1890s? If so, it may well be worth going through their early issues, just in case it was in one of these, not the T.E., where the photo appeared. as many have described as being in the missing photo. On the contrary: the human mind has a remarkable capacity for "filling in" details that are not actually there. 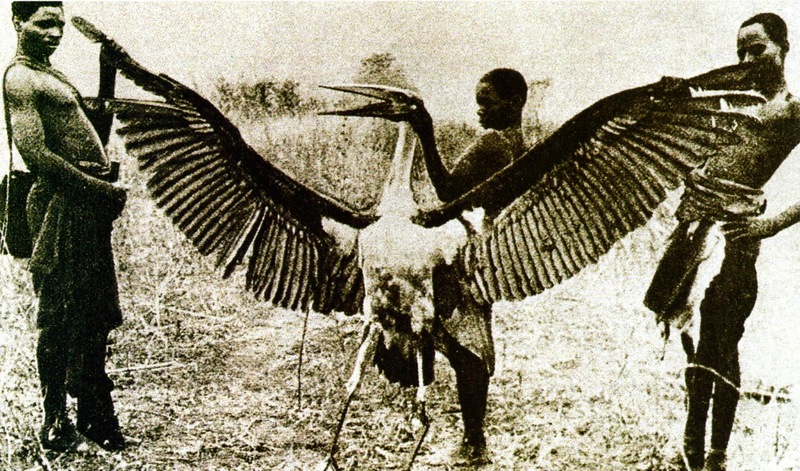 The sight of the very striking marabou stork image may well be more than sufficiently memorable for the viewer, years later, to be convinced that the human figures around it were civil war soldiers rather than African natives. The same phenomenon explains how sightings of inanimate objects have in the past been deemed to be animate mystery cats, man-beasts, ghosts, and all manner of other entities. I also remember vividly seeing a picture like this... very old looking picture...grainy, unevenly sepia toned as if from age..four or five men standing in the foreground with a very large bird hung up to the side of a building..
Not saying it couldn't be, just that it also could very well not be, of course the picture could have also been a hoax...but I will definitely look into this. Even if photos in newspapers weren't common before 1900, weren't "etchings" of photos common? (The only reason that occurred to me is because of the etching of what might have been a photo of the "1897 Airship" in a Chicago paper.) If one of those appeared in the Tombstone Epitaph, it might be a lot less binding than an actual photo, but it would still be something to look for. There's also been an apparently old photo circulating around of a cowboy who has apparently shot a small Colorado "river dino", but I believe it is considered by many to be a hoax.. Yes, I've seen that one, intriguing but almost certainly a hoax. "Hi there! Reading your article on the thunderbird and thought I would pass along something of interest. I also remember seeing the thunderbird photo in a book, but in the early 80s. It was something I picked up from the local library and the pic was just like the one somebody described in your comments section. Since I have always followed this story, I was really interested in an old photo shown on an episode of Wild West Tech of all places, a show hosted by David Carradine before he died. This photo showed what looked like a pteradactyl, but it was held by KNEELING civil war soldiers, not nailed to a barn. I was fascinated because it looked real so I paid attention. The episode was not about pteradactyls - ha but the photo was stuck in strangely. I cant remember which episode now, sorry, but I did look for a photo credit at the end, there was none. I googled the show to try to see it online and learn more but it was unavailable. I would love to see that pic again and learn of its origin and possible authenticity. The soldiers might also be muddying the waters for others that saw it in contrast to the barn photo. If you look into it and find any info, please share!!!! Thanks, C.F." Has anyone seen this episode or knows where it can be viewed? Would be excellent to check it out! I'll have more to comment on this at a decent hour. Thanks for your info. The last of those fake thunderbird photos linked by you in your comment is debunked in my article here. I remember seeing this episode of Wild West Tech too! It was the Season 3 Episode 3 one title "The Unexplained" (http://www.imdb.com/title/tt0748486/) and aired on September 27, 2005. I did a quick online search and couldn't find an online version of it, but the DVD of the episode is available from History Channel at http://shop.history.com/wild-west-tech-the-unexplained-dvd/detail.php?p=69263&v=history_show_wild-west-tech. My memory of the photo is from seeing it in an encyclopedia of the unknown at school in the 80s - it's one of the things that got me interested in Fortean phenomena. The encyclopedia came in an edition of about half a dozen books and despite trying to track them down over the years, I have have not managed to find any copies. Karl I am thinking someone should look into Ivan T. Sanderson's archives and personal belongings if they are still around to see if anything turns up. I am sure in the 90's I remember seeing an old Civil War era photo of 5-8 soldiers and the thunderbird somewhere, in a book from either the 80's or 60's but most likely the 70's.